November 20, 2013: The world�s largest electronics retailer thinks stores are an asset in the fight with online retailers. Why is it so hard to find a doctor? October 13, 2013: Half of doctors in the state are not accepting new patients. A prescription for the problem. August 4, 2013: A new bestseller interprets history�s most influential man through the volatile world he came from. July 22, 2013: Mike Lazaridis invented the Blackberry. Now he wants to create an industry around quantum computing. July 18, 2013: The ability to analyze human behavior in real-time and on location is coming, but we�re going to need to mash-up data to do it. May 19, 2013: If another massive earthquake hits middle America, what would happen? May 12, 2013: Technology has greatly improved how we prepare for, respond to disasters. May 7, 2013: Tornadoes are true freaks of nature. How should communities prepare? April 30, 2013: A dollar spent in preparation can save $4 in response time. April 23, 2013: Storms aren't getting more severe, but they are getting more costly, as populations expand into new areas. April 16, 2013: 20% of H-1B petitions granted last year went to just four firms, all outsourcers. That's just one of several proofs that the controversial visa program is hurting U.S. tech. Spring 2013: Viral marketing is an appealing concept, but recent research suggests it does not describe how online adoption usually takes place online. 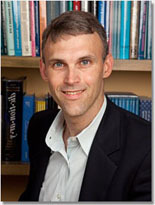 March 14, 2013: Yale University's CIO discusses his career path, disruptive forces in education technology and more. What�s Excel�s Place in Big Data Age? March 4, 2013: Microsoft has its own opinion. But do CIOs want to make Excel the analytics engine for the masses? February 11, 2013: Newly hired data scientist Jayanth Garlapati talks about blazing trails and his job helping DonorsChoose mine trends in teaching innovations. January 23, 2013: Corning developed a flexible glass, but the real breakthrough was figuring out how to mass-produce it. January/February 2013: Where will autonomous (and semi-autonomous) cars go? January/February 2013: Native speakers and computer scientists combine forces to make more languages available online.